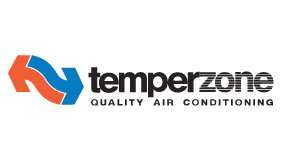 Temperzone is Australia's largest manufacturers of reverse-cycle, split system air conditioners. The company has been supplying units to the residential, commercial and industrial markets for over 50 years and have manufacturing facilities in Australia and New Zealand. Temperzone's mission is to provide the most competitively priced, reliable and efficient air conditioning equipment available to the international market. Temperzone units are designed and built in Australia and therefore suit our climate and conditions. With higher air quantities than the competition they are ideal for Australia's larger homes and hot, dry climate. temperzone units have the ability to operate from -4 degrees Celcius to 52 degrees Celcius. A temperzone airconditioner can handle any climate condition Australia can offer. Temperzone just make air conditioners for the Australian climate. They do not make televisions, videos and DVD players, just air conditioners to suit our harsh conditions. Although the name may not be as well known, they are the experts in Australian air conditioning and have been so, for over 50 years. All Temperzone outdoor units have standard epoxy coated condenser coils and stainless steel fixings. The cabinets are made from Galvanised steel and further protected with polyester powder coating. As much of WA is situated along the coast or river, long-life coils and cabinets are a must. For more information on actual test results on the epoxy coil. Click here to see the accelerated salt-spray test. Temperzone condensers are some of the quietest if not the quietest, on the market. To help keep noise levels down, high efficiency scroll compressors in an acoustically lined and fully enclosed cabinet are coupled with low noise sickle bladed fans. With council noise requirements being so stringent, the selection of the wrong unit can be time consuming and costly. With new government requirements focused on energy efficiency through the MEPS program, Temperzone have found themselves in the box seat with some of the highest EERs (energy efficiency ratios) around. With reverse-cycle air conditioning being the most efficient form of heating available, it won't hurt the hip pocket to run either. A five year warranty is available on units 26.5 kW and under. Conditions apply. Temperzone has full testing facilities so you know the capacity, air quantity and noise levels are actually what you're going to get. Many air conditioning manufacturers base their capacity only on a calculated compressor size and may not actually achieve the theoretical result. With the largest capacities, lowest profiles, top discharge, side discharge, vertical fan coil units, large single phase units and more controller options; we have an air conditioning unit to suit you.